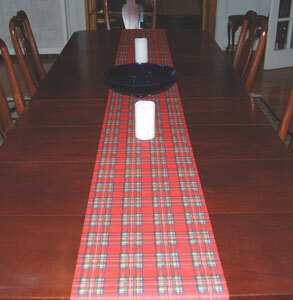 April 6th is Tartan Day - dinner is haggis, tatties and neeps with tartan napkins, of course. We added a starter - haggis crips and dessert - shortbread! Dinner is here - Start with an appetizer of Haggis Crisps (and perhaps a beverage?) then dinner is Haggis, Mashed Potatoes(tatties) and Mashed Yellow Turnips(Rutabagas)(neeps) - you will need to add milk and butter! Dessert is delicious Shortbread in classic petticoat tail rounds. 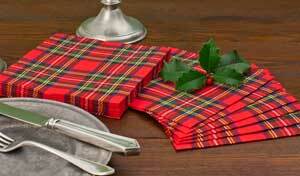 A packet of Classic Plaid napkins will give your table a tartan touch. Celebrate Scots in America on April 6th, declared a National Day by President Bush in 2008. April 6th in 1320, Scotland signed the Declaration of Arbroath declaring independence from England. Founding Father Thomas Jefferson used the Declaration of Arbroath as a model when creating the Declaration of Independence. Inside each Tartan Day Dinner Box is a parchment page with the 2008 Presidential Proclamation and the Declaration of Arbroath. Maybe some day Tartan day will have the same recognition as St. Patrick's Day - but as a celebration of Scots contribution to our great country. Share this day with friends and family! 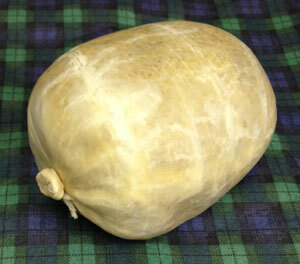 Haggis Ingredients: Lamb meat, oatmeal, onions, beef liver and spices. This is a perishable food. If you are ordering perishable foods, or a combination of perishable and non-perishable products, our shipping charges are based on the value of your order and the type of products you are ordering. Please use the Shipping Costs section of the shopping cart to get the correct value for shipping. If you live within the 19 states we can reach within two days via UPS Ground, you will be 'upgraded' to ground shipping for perishable products like cheese and smoked fish, to save you from being charged for UPS 2ND DAY AIR. For more detailed information. please visit our SHIPPING INFORMATION for UPS 2ND DAY AIR charges. Shipping Policy: We ship via UPS within the 48 continental states. If we can ship your perishable package via ground transportation to arrive in the same time as UPS Express, we will ship via Ground UPS and reduce your shipping charges accordingly. Our goal is to get your package delivered in the right time at the lowest possible cost to you. ALASKA & HAWAII: All shipping to Alaska and Hawaii is via Priority Mail through the US Post Office. Higher charges will apply and you will be charged according to the USPS stated rates. We will use Flat Rate Priority Mail boxes as much as possible to keep shipping charges to Alaska & Hawaii as low as possible. We normally ship your order within one business day of your order. Orders placed after 2PM EST will ship the following business day. Perishable orders will be shipped on Monday, Tuesday, and Wednesday only, via Second Day Air.